During this 3-hour seminar, we discuss the mental and physical aspects of self defense, how to mentally prepare yourself for a violent event, and physical techniques to consider if you ever find yourself in a situation. Part of this seminar is a classroom style presentation, with a lot of information regarding the mental and psychological aspects of self defense. We work on some basic survival techniques and motivate women to train consistently. This seminar can be used as a good introductory class into the martial arts, as an informational class for students or groups, or as a safety course for businesses and corporations. All of our Women’s Self Defense Seminars are FREE to both the host of the venue and to the attendees. We encourage attendees to wear comfortable clothing and bring water. Mature topics are discussed, attendees are advised that some ideas and situations discussed will be of sensitive nature and may bring up discussions with young ladies after the seminar. INSTRUCTOR: Any certified instructor through the Warrior Forged Project may obtain hours of experience through teaching our classes, in order to qualify for advanced instruction and training. As much physical self defense as we can pack into a 2 hour course. Including choke, headlock, and bear hug escapes, ground defense, knife, firearm, and stick defense, and using improvised weapons, body language for self defense and combat. Technique and concepts taught will be mostly from the art of krav maga. This is a high-intensity course designed for groups that want a self defense course which only incorporates the physical aspect. 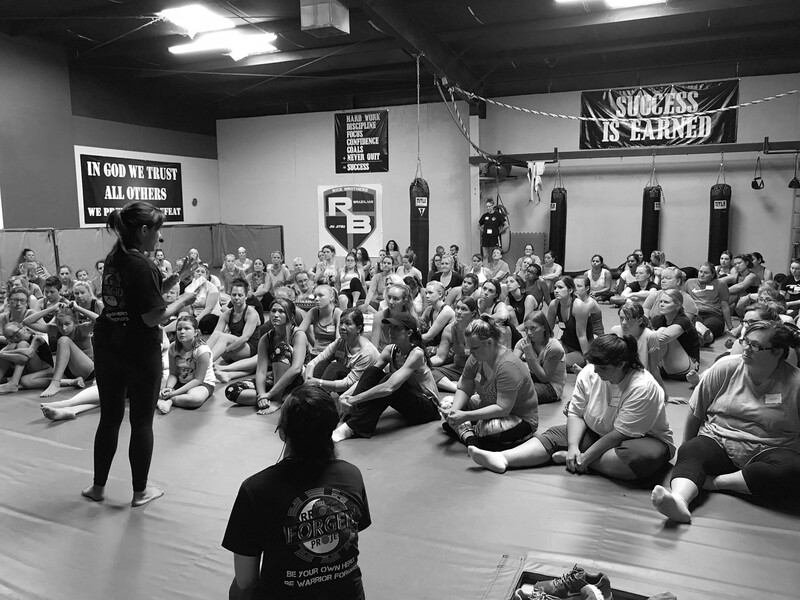 We highly suggest that anyone signing up for our 2.0 seminar have previously attended our FREE Self Defense Seminar as the techniques taught are more advanced. All ages and fitness levels are welcome and we will work with you no matter what your physical limitations are. This seminar targets women and girls ages 13+ and costs $20 per person. All proceeds go to the nonprofit as funds to support the project. None of the funds go to instructors or individuals. These courses are similar to our Women’s Self Defense Seminar, but are gauged towards addressing issues of the teen, pre-teen, or college student. We work a lot more ground defense into this seminar and discuss mental preparation, safety, body language, and the importance of defending yourself, as well as self worth. This course is good for groups of teens, classrooms, team-building, schools, private groups, sports groups, and more. This seminar targets elementary school, middle school, high school, and college students. These courses are similar to our Women’s Self Defense Seminar, but are gauged towards the family unit. We discuss mental preparation, safety, body language, and the importance of defending yourself, as well working as a team to insure your families safety at all times. We also talk about safe places outside the home, secondary safe places, the power of intuition and listening to your gut, use of improvised weapons, using intelligence, and always focusing on awareness. This course is good for families, groups, reunions, and is appropriate for all ages and fitness levels. Signing up for one of our free seminars is quick and easy. Just follow the link below. Our current seminar and class schedule can be viewed via the link below.